This Nine of Pentacles card indicates that the querent has reached a stage in their lives where they are confident, independent and self-sufficient. Through hard work, this person is now ready to enjoy money, leisure and material comfort. The difficulties that were faced in the earlier journey of the pentacles appear to be over. The Nine of Pentacles conveys not only joy, but also the feeling of security and freedom that material wealth can bring. Looking back, the querent can now celebrate the difficulties, the struggles, and the hard work that lined her path. Her previous challenges gave her the wider perspective she needs to understand the spiritual value of her success. Knowing how difficult it was to get here, she intends to enjoy every single day that is given to her. The Nine of Pentacles conveys not only joy, but also the feeling of security and freedom that material wealth can bring. Like the other nines in the tarot, sometimes this card indicates that the querent has not yet reached completion in their journey. There is something that is missing here - the element of her community and relationships. The gifts of the suits are meant to be shared, and yet this woman is so far from home. The Nine of Pentacles can also be about a specific time period of this person s life. This time is about restraint and grace. Diplomacy and grace will lead to the desired outcome. 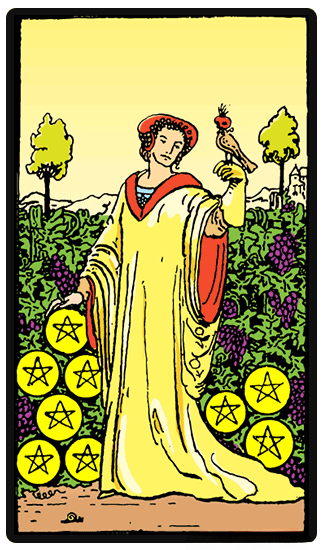 The Nine of Pentacles reversed can be indicative of suffering from financial issues. It can perhaps indicate a false display of security and stability. There may be a desire here to keep up appearances - to have all the finer things in life even when we cannot afford to do so. Where does this stem from? Take this as an opportunity for you to figure out what it is most important. The Nine of Pentacles reversed indicates a moment when one truly sees - perhaps for the first time, that we cannot depend completely on material wealth to bring happiness. Other meanings of this card differ with context - you may instead find yourself at a period in life where you should be able to rest and relax after years of hard work, but you find yourself unable to unwind. In this case, rejuvenation is the ultimate advice of the Nine of Pentacles reversed. You need to take a few steps back and allow yourself to rest and regain your strength.